The sculptor Thomas Brock was born in Worcester, but came to London in 1866 where he became a pupil of Foley, and then, in the following year, entered the Royal Academy Schools. When Foley died in 1874, Brock completed many of his unfinished commissions. This gave him a smooth route into respectability. He became ARA in 1883 and RA in 1891, his diploma work being a bust of Lord Leighton PRA. Brock produced many portraits and memorial sculptures; indeed he seems to have been one of the most industrious sculptors of the time. His works include Sir Bartle Frere in the Victoria Embankment Gardens, the tomb of Leighton in St Paul's Cathedral (1900) (and the bust of him in the National Portrait Gallery) and on Charing Cross Road the statue of the actor Henry Irving . On the Mall is a good Captain Cook , in Portland Place is a large bust of Joseph Lister , the surgeon, and a statue of Gainsborough is on the staircase in the Royal Academy. 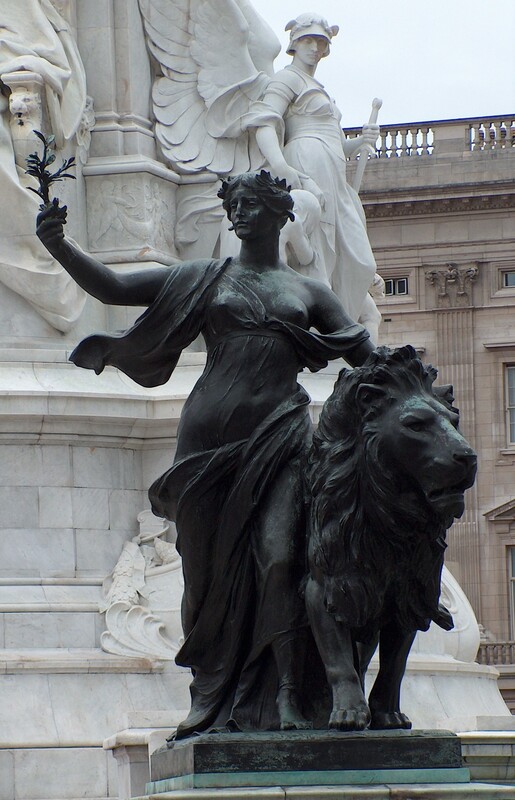 His greatest triumph, however, was the Queen Victoria Memorial (1906-24), which won him a knighthood. 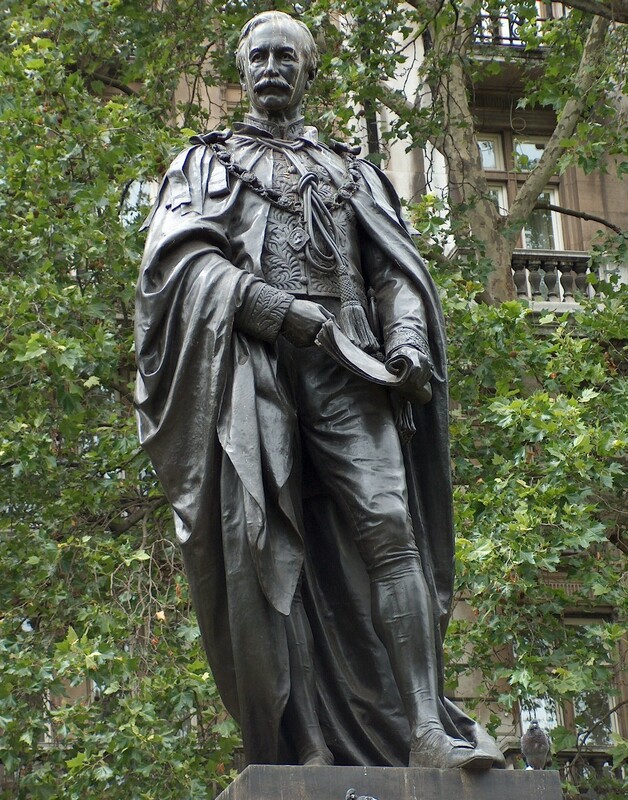 Outside London, he other Queen Victorias in Birmingham, Worcester, Hove and elsewhere, an equestrian statue of the Black Prince (1902) for City Square in Leeds, and a portrait sculpture of Colman is at the Castle Museum, Norwich. We may also note the statue of Sir Roland Hill in Kidderminster, Bishop Philpott 's effigy in Worcester Cathedral, the Gladstone Monument with two allegorical figures by St George's Hall, Liverpool (picture of one of the figures shown on this page), and Bishop Hervey in Wells Cathedral. 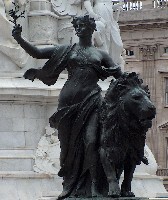 Allegorical figure from the Victoria Memorial . We should mention Brock's ideal sculpture. This includes an Eve (of which a version is in Cardiff), The Genius of Poetry , A Moment of Peril showing a native American on horseback stabbing at a serpent, Salmacis , and various angels and allegorical figures associated with his major memorials, including a variety on the Victoria Memorial . In these works, he favours a solidity and massiveness that gives all of his work a monumental feel. Although his works can be characterful, and some of his portraits even ironic, much of Brock's work shows a certain coolness in mood, similar to that of Leighton's pictures.